We’ve hit ground zero for classic singles! 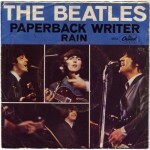 It really doesn’t get any better than the coupling of “Paperback Writer” and “Rain” on a single slab of 45RPM vinyl. And, the single wasn’t even intended to be a double A-side, it just worked out that way on the strength of the material. Both songs were cut during the sessions for Revolver in which The Beatles began to spread their creative wings and experiment in the studio. “Paperback Writer” was recorded with a boosted bass sound because Lennon wanted to emulate the bass sound on a Wilson Pickett record he liked. It was also cut much louder than other singles of its time to make its searing guitar riff stand out on the radio, and as a result, the song topped the charts in 1966. The song is written in the form of a letter from an author to his publisher talking about a book he’s written based on “a man named Lear.” Lear was Edward Lear, a Victorian painter who wrote poems and prose whom John Lennon admired. 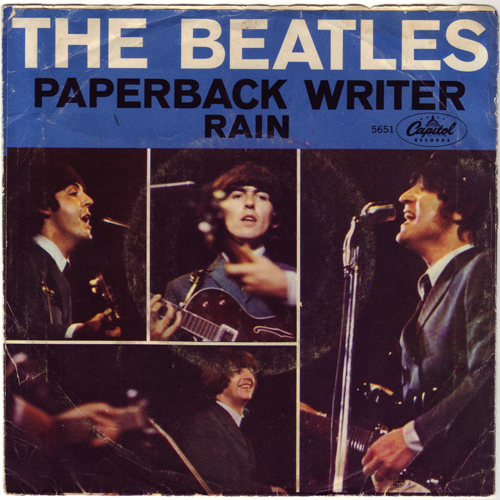 Paperback books were seen to be a cut-rate second cousin to hardcover books which were looked upon as works of art, so the writer in the song is only striving to be a paperback writer. During the song, Lennon and Harrison interpolate the French nursery rhyme, “Frere Jaques” as a counter melody. The “meat and dolls” photo that graced first pressings of the Yesterday And Today album was originally taken to promote this single in the trades, and a promotional film directed by Michael Lindsay-Hogg was created showing the Fabs traipsing around an English garden. On the flip, is “Rain,” one of The Beatles’ all-time greatest tracks exemplifying the amount of experimentation the group were putting into their recordings of the time. “Rain’s” backing track was recorded faster than normal and played back at a slightly slower speed giving the record a psychedelic off-kilter feel. Conversely, Lennon’s vocals were recorded at a slightly slower speed and sped up during playback making his vocals sound slightly higher than normal. The song reached number 23 on the charts as a B-side, and Ringo Starr considers his drumming on the track to be his best recorded performance. The single’s picture sleeve inadvertently depicted Lennon and Harrison playing left handed because Capitol’s art department mistakenly reversed their photos. Three videos were created to promote “Rain,” directed again by Michael Lindsay-Hogg. (Lindsay-Hogg first worked with the group on the set of Ready Steady Go several years earlier.) One was filmed at Chiswick House in London and shows The Beatles walking and singing in a garden, while the other two feature the band performing on a soundstage. Posted: April 15th, 2015 under Music, Rock, The Beatles.